Gilkock Football Academy over the weekend received a shock when Mathew Jassey fractured his right leg at the academies training when he collided with Lamin Ceesay in the middle of the park. 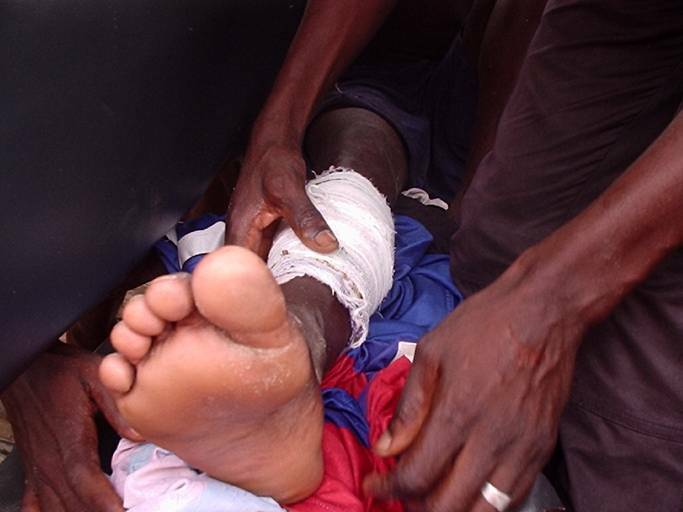 Mathew ran to receive a pass from Bubacarr Charty when Lamin Ceesay alias Wuyeh stretched his leg to collect the ball. The injury will keep Mathew Jassey out of action for a period of at least three months according to the academies local physio Momodou Darboe at his local bone relocation centre in Brufut the very day of the fracture. I am very worried to learn that my injury will last for at least three months before I will start running but I hope it heals earlier than that because I really want to join my colleagues as soon as possible.. Since I was injured I was always surrounded by the boys and the coaches from the academy. Everyday my coaches and team mates and even those from the junior teams and the senior teams are always with by my side keeping my company. For Lamin Ceesay who fractured my leg, he has also been helpful to me as at first he was worried but I asked him to keep cool as it was not his intention to break my leg. He too is always around me giving me courage. I thank everyone in the academy and telling them that I am missing the camaraderie in the field of play but I’m recovering speedily. Mathew said. 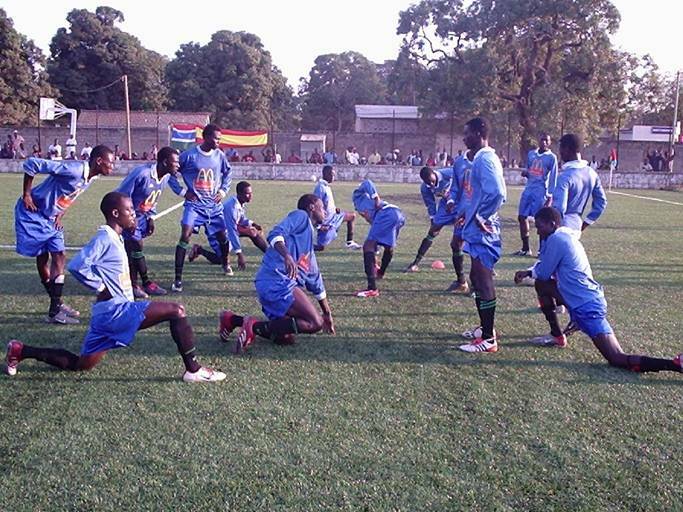 For the head coach and technical director of Gilkock Buba K Jallow when it happened everyone in the academy was very worried as an injury of that nature has never occurred in the academy for the pass five years of our operation. However we quickly took him to the local physio who took immediate control of the lad. He has been a very intelligent player as his ambitions cannot be summed up. On behalf of the academy staff and players I wish him a speedy recovery. Rut and Anneke Rassendelft of Holland presented football materials to Gilkock football academy on Saturday December 29th 2008 at the academy’s training ground. The materials include 6 sets bibs, 40markers, a set of jersey and 26balls. Receiving the materials on behalf of the academy Sang Mendy the public relations officer thanked the donor for the assistance and pledge on behalf of the academy to put the materials into good use noting the importance of having such an assistant from the Rassendelft family. ʽthis is not the first time you guys are helping us, obviously we have nothing to pay you but only to thank you for the help and ask you to continue helping the academy in other areas of importance in the future. Rut and Anneke told the Gilkock website www.gilkock.com they are happy to associated with Gilkock as they have met responsible people helping their younger brothers and sister to acquire skills in football. We will not hesitate to help you in other areas if the need arise and we have the opportunity is there Anneke stated. 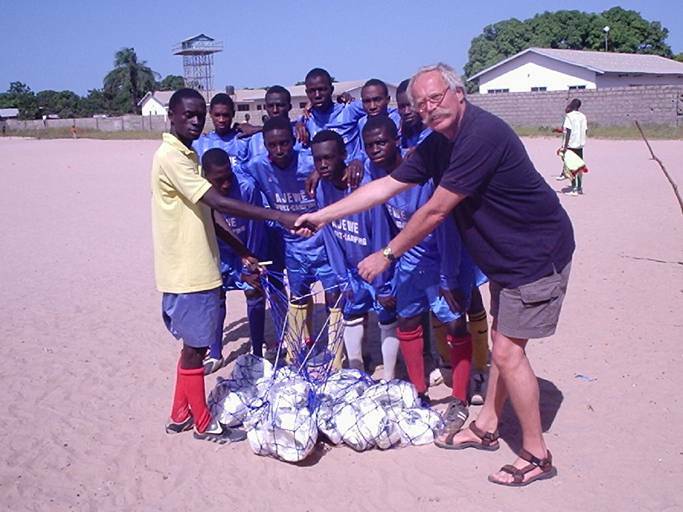 These are amongst some of the materials donated by the Rassendelft family since they were introduced t Gilkock by Ebrima Jatta alias E.
Gilkock football academy Brufut branch recently received the sum of £100 from Amy and her grandmother based in the United Kingdom through the Garforth family resident in Brufut. Handing over the cash on behalf of Amy and her grandma to Buba k Jallow, Mr. Brain Garforth urged the academy to put the money into good use as Amy and her grandma has been assisting the academy over the years. The money collected and send to you is to be rightfully utilized. Brian said, receiving the money on behalf of the academy Buba k Jallow thanked the donor and the Garforth family for assisting the academy with such an amount of money when the academy is in dare need of money to transport the players to and from Brufut tournaments for within the coming months. 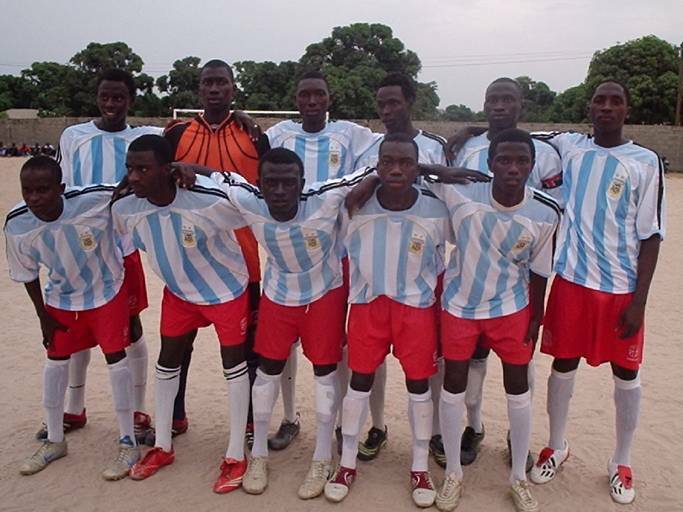 This said money has been used to facilitate the academies trip to Brikama for an inter academy tournament and the balance as well will be used in the forth coming inter Gilkock tournament in Bakau come the Christmas holiday. 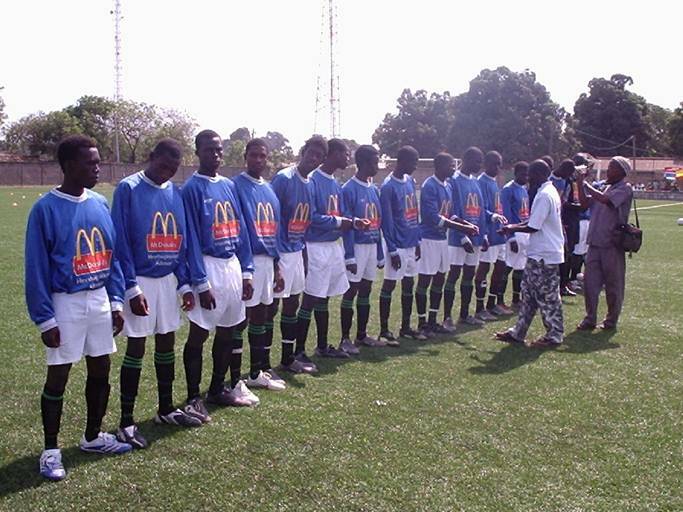 Sang Mendy the public relations officer of Gilkock also echoed similar sentiments at the handing over ceremony and appealed to more people to emulate Amy and the old grandma noting it is difficult to run an academy without finance as it would have been difficult to transport all our player to the just concluded tourney in Brikama Mendy stressed. Gilkock football academy were shocked and surprised as both the under 14 and 16 were beaten in their opening games in the four team tournament organized by Canarias football academy and hosted by Brikama in the newly built artificial turf. Watched by hundreds of spectators in the morning game the under 14 captained by Lamin Sonko alias daddy lost 2-0 in the hands of host Brikama and coached by Modou Bojang Gilkock’s newest coach. Speaking to the Gilkock website www.gilkock.com Modou Bojang cried foul play saying my boys played against opponents who were far older than them I think. At first when I saw these boys coming into the pitch I thought they were the ones to play our under 16 side. But I motivated my boys to play well and indeed they have raised their performance and I hope they learnt from their opponents’, Modou concluded. For his part team captain Lamin Sonko who was crying whilst talking to www.gilkock.com said in his life as a player he has never been disappointed with opponents and vowed if their opponents were not too old for them they would have given them a good run for their money. You see the game yourself and have seen the way we played them. If they were as young as we are we would have beaten without doubt. This is a lesson for both the players and coaches of Gilkock to learn from captain Sonko stressed. Meanwhile the under 16 who lost to a Steve Biko football club by 2-1 also claimed they been blind folded as they thought they were coming to play against an academy like them but were rather forced to face the first division side of Biko. Captained Ebrima Bojang and coached by Ebrima Bojang alias Salasi. Gilkock took an early lead through Momodou Jatta in the 17th min but Biko a more experience side leveled before the break. As the second half began Biko went ahead in the 6th min of the second half. This goal gingered the teenagers from Brufut as they stamped their authority and dictated the pace of the game till the end of the game but never got that equalizer. Momodou Jatta floated high a clinical finish when Sainey Jatta stroke the stand bar whilst kisima Bojang and Lamin Ceesay all came close. For Coach Ebrima Bojang, the lost of his captain in the early minutes of the first half was responsible for his teams defeat. Ebrima Bojang is the most experience player in the academy and having lost him due to a knee injury in the 14th min was a blow to me and the team. Salasi said. Buba k Jallow said he is proud of the new coaches for they are living up to expectation. 'For the boys I’m not surprised with their performance as they adhere to training programs well'. 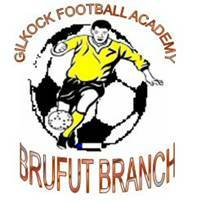 Following a brilliant performance against the super Nawettan squad of Gunjur from the lads on Thursday, the senior team of Gilkock football academy thrashed their neighbours Canarias Football Academy in Brufut 2 goals to nil on Sunday ahead of their four team tournament in Brikama. The second half produced a better performance from Canarias after effecting few changes but before these substitutes gained ground Gilkock registered their second goal courtesy of Karamo Jatta screamer when again over lapping full back Yusupha Bojang was brought down out side the penalty area. 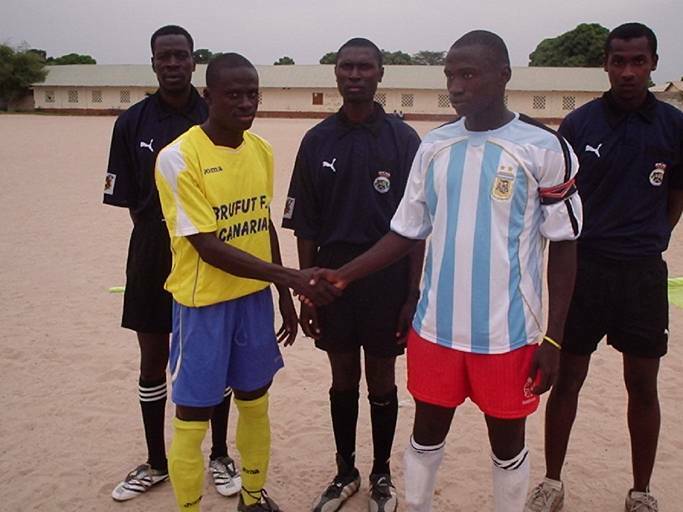 Kisima Bojang, Momodou Jatta and Karamo Jatta stood over the ball. Whilst the boys on the wall moved to block kisima from the shot Momodou Jatta push the ball for Karamo Jatta who fired in a absolute screamer for Gilkock’s second in the day leaving the Canarias guys desperate and disappointed with themselves. Earlier on Thursday the same boys drew 1-1 with a formidable super Nawettan team of Gunjur from Kombo South. 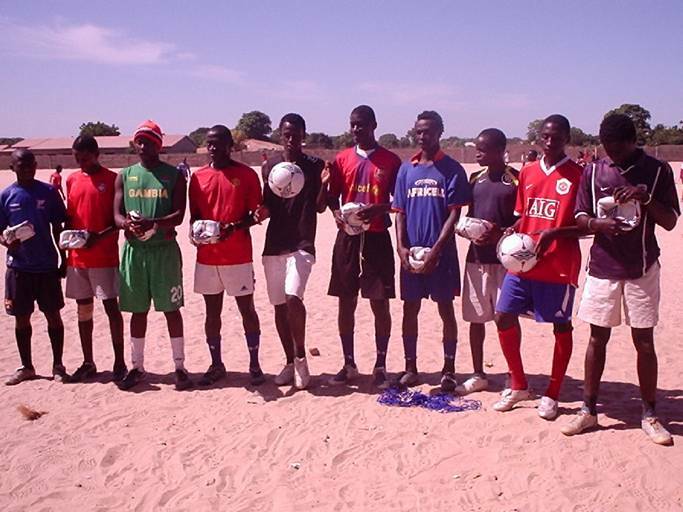 The Brufut based football academy on Saturday received an amount of ten footballs from the Pickett family based in UK. The balls all brand new were handed over to the academy by Mr. Ousainou Joof FOTGA’s country representative at the academy's training ground in Brufut. Handing over the ball Mr Joof commended the coaches of the academy for job well done. Mr Joof said 'it is very difficult to bring together kids of different cultural background but hence you took it upon yourselves to mould these kids to achieve their ambitions in the future all people can do is to commend you and on that note i urge you to keep it up and pray that your dreams of providing future professionals come sooner than you think'. For the players I urge them to be respectful to their coaches and work very hard to compliment the efforts of the coaches. For his part Mr Alieu Sanneh goal keeper trainer thanked the Pickett family for donating ten balls noting this will go a long way in making our training programs smoothly run. He also promised that the balls will be put into good use. The public relations officer Mr Sang Mendy made reference of the fact that for Gilkock to be known today globally is because of the Pickett family as they are the ones who first donated to Gilkock Brufut branch and also they are the ones paying for the upkeep of the academy's website www.gilkock.com for the past three years. We have everything to be proud of the Pickett family and we are even thinking honouring this noble family.